One achievement of the Revolution was the liberation of card makers from reproducing the official standard pattern. 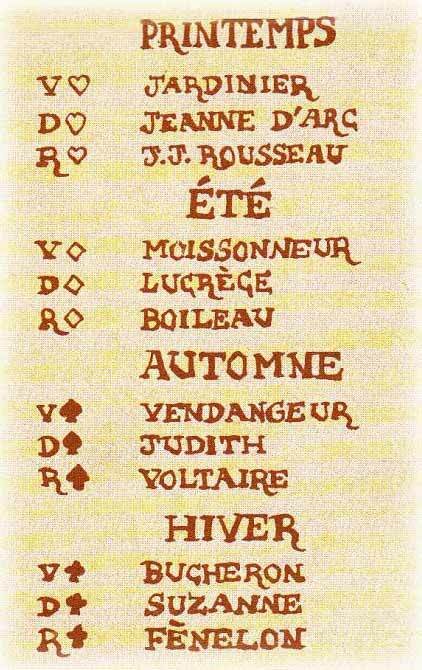 “Jeu des Quatre Saisons de l’An II” is a French Revolution pack originally printed from woodblocks and coloured with stencils and published by J. B. Debeine (Reims) 1793. The traditional hierarchical royalty have been replaced with new humanist figures including rural activities and philosophers. Bibliothèque Nationale de France, département Estampes et photographie, PET FOL-KH-34 (A, 26). A facsimile edition titled “Jeu des Quatre Saisons de l’An II” was published by Éditions Dusserre in 1988 (see below). 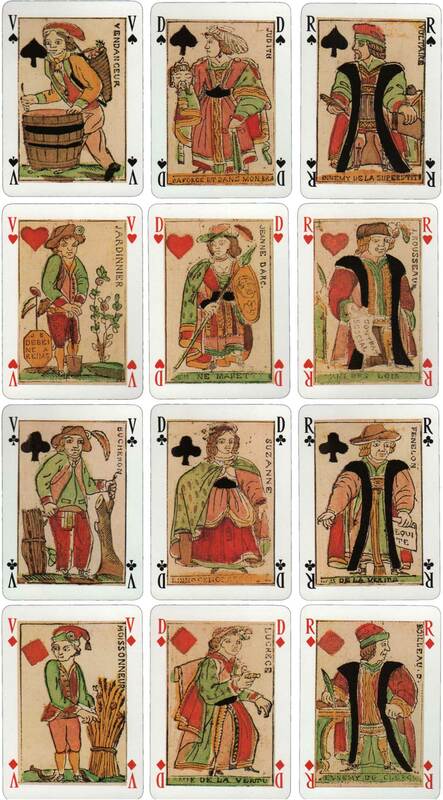 Above: “Jeu des Quatre Saisons de l’An II”, facsimile published by Éditions Dusserre in 1988 of original deck published by J. B. Debeine (Reims) 1793. 52 cards + 3 jokers + extra card in box. Images courtesy Matt Probert.